Big Ben is the easily recognized clock tower at the north end of the Palace of Westminster in London. A British cultural icon, the tower is one of the most prominent symbols of the United Kingdom. 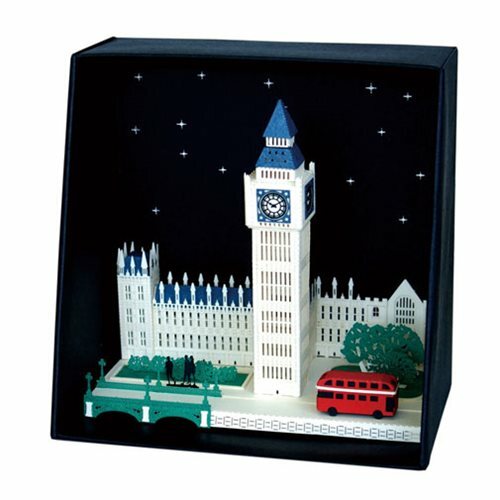 Take your papercrafting to the next level with this Big Ben Paper Nano Model Kit! Laser-cutting technology allows you to build the world-famous structure in more detail than ever before, and it's the perfect display piece to show off your papercrafting skills! Detailed color instructions and a folded display case included. Ages 12 and up. Paper Nano models are made of laser-cut paper. Carefully punch each piece out of the labeled cards. Then curl, fold, and attach with tabs or glue as instructed. Be patient and have a steady hand! Suggested tools for the build include tweezers and an X-Acto knife. Keep some clear-drying glue on hand, and possibly a toothpick for application. Includes pictorial build instructions. Tools and glue not included. Ages 12 and up.